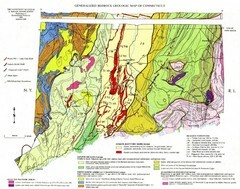 Geologic map of Connecticut bedrock. Shows shaded terranes, fault lines, and Mesozoic formations. Check out this Zip code map and every other state and county zip code map zipcodeguy.com.